As a small business owner you have worked hard to make a product or offer a service for your customers that meets their needs. You’ve done research to perfect your craft, its been tested and critiqued, re-tested and improved and now your customers love what you’ve provided them. BUT NOW WHAT?? How do you keep the momentum going? But one thing to remember as you are working to continue to build up your owner base with new bright-eyed customers, and that’s not to forget to appreciate and thank the existing customers you already have. It is always important to make sure you find ways to keep an influx of new customers coming when you’re a small business owner, but it is even more important as a small business owner to keep the existing customers happy too. If you only focus on one versus finding a way to accommodate both side of the spectrum, you’ll end up with a full bucket of new customers with a leaky hole of the old customers not returning as repeat customers. You must work to ensure you pay attention to both the inflow and potential churn and release within your bucket. If you learn nothing else today, remember that its just as important to get new customers as it is to keep your existing customers happy. 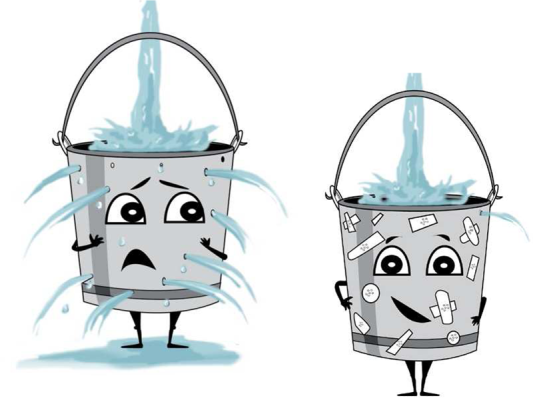 Happy customers can equate to more happy customers and a very happy non-leaky bucket. So since you as a small business owner are already doing an amazing job getting customers, here are a few tips to review and check off your list to ensure you are also doing the same amazing job of keeping those customers happy with your product/service. When you dreamed about your business, you imagined and hoped everything would go smoothly, from ordering to delivery to the customer actually getting to utilize your goods first hand. But we know from experience that NEVER happens. This is why you must above all else make sure you provide good customer service for the “what-if” scenarios just in case. Whenever a customer makes contact online, make sure to have at least an auto-response that thanks them for signing up, purchasing or reaching out to you. It may seem small, but this gesture goes a long way. Just in case a customer wants to make contact with you, have at least (2) ways a customer can communicate with you. Email is always a mandatory, but the second option you pick should be a more time-sensitve tool (i.e. social, chat or phone). Make sure whichever option you select that you can respond in a timely manner, and if not please disclose the turnaround time to set customer expectations. Nothing is worst than reaching out with a problem to a company feeling hopeful and then ending up feeling like you were given the run-around because you were not made a priority after spending your hard earned money or worst, no one responded at all. You are the expert on your product, not your customer, so make sure to proactively account for questions. Most products come with necessary instructions incorporated when they are provided, but there are some instances when further explanation or questions may arise. You may have sold your goods, received payment and are on to the next sell, but if you want this customer to remember your small business the next time they need a service or goods like yours, you must continue to engage with the customer after the sale is complete. For example, if you have a monthly subscription based business, you must give customers a reason to keep coming back for more. If they feel they are not getting their monies worth they will cancel. Or if you constantly are acquiring new products that were not available the last time the customer purchased from you, you must continue to engage with the customer to let them know what’s new. You need to constantly engage with your customer because in a world full of things to distract them (i.e. work, family, bills, passions and other competitors), you must help the customer keep you top of mind so when the right time comes they think of your business as the place to purchase or utilize. One clarification I want to make is that constant engagement is different for each business or situation. It could be a monthly informative email communication with product updates, a weekly social post to bring some cheer to their day or a special event announcement exclusive to your customers. Whatever works best for your business you can decide, but you must keep in touch with your customers or someone else will do so and take your place. A customer by definition is the recipient of a good or a service, or a product, or an idea, obtained from a seller, vendor, or supplier via a financial transaction or exchange for money or some other valuable consideration. But in actuality, a customer is much more to you. A customer to your business is the person who took a chance on you and your goods, they believed you could fulfill a need they had and they took an action and tried your product. Your customer should be rewarded for that. It could be a discount, but that should not be the first kind of reward to be considered. Early access – If you request a customer’s info (name, email address, phone number, etc…), and provide an opportunity to opt-in to getting future communications from you so you can give them early access to new products or events you are creating. Nothing feels better than feeling like you have the inside scoop or get early access to a secret. It shows you appreciate the customer’s business. Contest – Even though engagement is a separate section, it also can fall under customer appreciation as well. It is a way of providing relevant content to your customer based on their demographics and buying behavior. For example, if your product is focused on travel, to reward your customers you can hold a contest with the reward being a travel prize. Now it can be just a contest to show appreciation of your customers, but you can also benefit from the tactic. By leveraging the contest to get insights from your customers, you can ask them to answer some travel related questions to be entered into the contest. Just another way to cost effectively provide additional value to your customers and your business. Finally, do you know where you can find FREE advertising??? Look no further than a satisfied and loyal customer. If you treat them right, satisfy their needs and concerns, make them feel important and valued, then you will create a walking and talking free advertisement from your customers. When you put in the steps to patch the leaky bucket then you build the a base of customers that will be willing to help you in anyway. You can reach out and ask them for feedback and product reviews. This feedback in return can be utilized to reach and persuade new potential customers to try your products out. Advocacy is the ending and the beginning of the customer lifecycle and is extremely important. A brand advocate will be reaching out to you to get an update on when the next subscription is coming out or when they new product will be ready. In my experience in advertising, I’ve seen a brand advocate fight off a naysayer online and defend products they care deeply about. Think about how deeply Beyonce’s beehive will fight and defend her no matter what. She may be a artist, but the ties between her and her fans and your small business and its customers are the same. It is important to form a relationship with your customers before and after they become your customer. When you work to make a customer happy though cause and effect, you will create the loyalty you desire and then there is nothing stopping your business after that.